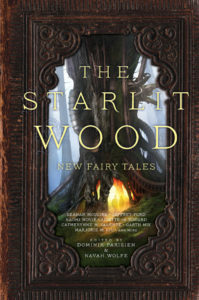 Once upon a time there was The Starlit Wood, edited by Dominik Parisien and Navah Wolfe. It won the Shirley Jackson Award, was shortlisted for the World Fantasy Award, the British Fantasy Award, and a whole slew of other awards. It re-imagined seventeen fairy tales and gave us fresh ideas of what once upon a time might mean. Then I asked the authors questions, coz that’s what I do, and they kindly answered. First cab off the rank is Stephen Graham Jones, talking about his tale “Some Wait”. 1. What was the inspiration for your story in The Starlit Wood? When I drew the Pied Piper from the list of possibles and looked the story up, what stuck with me most was the clothes he’s supposed to have worn, they were patchwork, piecemeal, but usually described as “piebald,” which, to me, carries with it a sense of age, of worn-downness, of always-been-with-us, and it also, of course, conjures King’s Lisey’s Story. I think there’s some piebald scary stuff in there, of the vast and cosmic variety. And Rorshach’s mask is mixed in there as well. That’s where my story in Starlit Wood starts, with the black and white, the splotches. 2. What appealed to you about a fairy tale anthology? The chance to bloody these stories up even more than they already are. It’s so fun to reach into a story everyone knows, find the beating heart, and pull it out, lay it on the table. ? 3. Can you recall the first fairy tale you ever read or that was read to you? First one I recall is Rumplestiltskin, which Laird Barron’s completely ruined for me.? 4. What’s your favourite folk/fairy tale and why? Little Red, all the versions, but especially the ones where she uses some werewolf lore to take this werewolf down. I never like it when the Grandma lives, though. That always feels like playing it safe. But there’s a blood price to be paid for wisdom. And fairy tales aren’t supposed to be safe, anyway. That’s why we’re drawn to them.? Stories and stories and books and books, probably some poorly thought-out purchases off Craiglist, likely a wreck or three on my bike, and hopefully some scary movies. 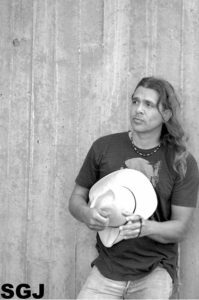 Stephen Graham Jones is the author of sixteen novels and six story collections, and, so far, one comic book. Stephen’s been an NEA recipient, has won the Texas Institute of Letters Award for Fiction and the Independent Publishers Award for Multicultural Fiction, has won a few This is Horror Awards, and he’s been a finalist for the Bram Stoker Award and the Shirley Jackson Award a few times each. He’s also made Bloody Disgusting’s Top Ten Horror Novels. Stephen lives in Boulder, Colorado. This entry was posted in fairy tales, News and tagged Dominik Parisien, fairy tales, Navah Wolfe, Saga Press, Stephen Graham Jones, The Starlit Wood: New Fairy Tales. Bookmark the permalink.